Heat the oil in a large nonstick pan until smoking. Add the chicken and stir-fry for 4 minutes. Then add the peppers, spring onions and bamboo shoots then stir-fry for 3 minutes. Mix the soy sauce with corn flour and stir with vegetables. 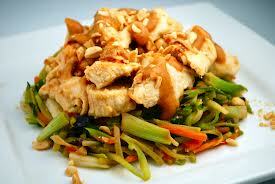 Stir in the cashew nuts and bean sprouts, heat briefly and season with oyster sauce.